A package of 100 HTML5 Free Template Bundle is here. List of 100 premium quality free HTML5 templates. Add them to your collection today. They're free. We all are familiar with offers like “Buy one, Get one Free”, “60% Off”, “75% Off”, “Summer Sale”, “Winter Sale”. And I can surely say that everyone loves Discount Offers. Bundle offer is also very popular because we get various things in a single offer package. I am going to tell you about a Bundle offer you haven’t heard yet offered by Themewagon. 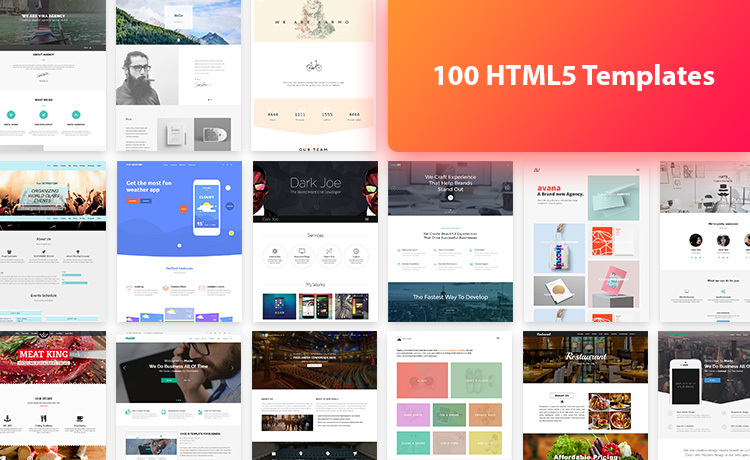 It’s 100 HTML5 Free Template Bundle offer. Yes! You’ve heard it right. 100 various free templates with just one click. And not a single one is crap here. Those who are trying to own a website for their personal or commercial business in a little expense can use this 100 HTML5 Free Template Bundle. But, it will be most beneficial for those web developer or freelance developer who are looking for high-quality templates for their client’s website. If you are a freelance designer or a web developer you can get this 100 HTML5 Free Template Bundle offer and keep these best quality free templates to your collection. So, when you get a project for a particular category website, you can pick one suitable from these. So, why thinking? Grab this 100 HTML5 Free Template Bundle today and save the hassles. Note: If you download this collection, you’ll get a ZIP file which is 551 MB big. 28K+ people already successfully downloaded it and we hope you won’t face a problem, as well. Hold tight in case of a slow internet connection. Adoraria receber o link ou sabre como posso adquirir estes 100 modelos Free pode me enviar o link por favor. A real Bootstrap in my work thanks guys keep up. This is one of the cool template of Themewagon according to me. The template bundles are also good. Please check your email inbox, the download link has been sent personally. The greatest thanks and luck from Japan. You are welcome and thanks to you too! Thank you for these amazing templates. I want to use your templates in a theme builder ! Is there any problem with you license ? pls send me the link to my email, chizimuzoemmanuel@gmail.com. thanks alot! Plz send me Download links. Still didn’t received any email from you.. Thanks. Thanks for this amazing gift! Hi can you send it to anythingwebrelated@gmail.com please? Thanks! Can we use these templates commercially for our clients? I am a freelance designer Please guide me If there is any restriction or license to use these templates for my client? You can check our license here. Thanks. I can get an amazing template. I can not develop it on my own. This bundle is amazing. The templates are amazing. Please send me the link ! it is quite interesting, pls. send me the download link. hope am not late. I’ve sent you the link. Hope it’ll be okay now. Please send me these templates. Amazing. Please sent me in mail…..
Hello Igor, I’ve sent you the download link. Can you please make another try? It’s a large file so it may trouble sometimes. Thank you anyway. Hello Harry, I’m sending you the download link. Would try once again? Btw, the size of the file is 551MB. Keep in mind before starting the download on a slow network. Thank you anyway. Can you provide me the download links? Yes the email address is the same one i’ve subscribed. Sent you again the link. Please let me know whether it works. HI, can you please send download link to creanet44@gmail.com. Many thx !!. Thanks for this template collection …. I tweeted, both download links are not working. I see nothing. Could you please email a download link to me at mender42@gmail.com Please? Thank you for the inspirational work! whats the exact size of download ? Hello, can you please sent download link to wouterzondag@hotmail.com. Many thanks. Please send me the download link. Thanks. What should I do with your email? I was kidding, LOL. Sent the download link. Please send me link..i didnt get it, tried 10’s of times. I really love your work…keep rocking n blessings sir. Sent the link. Hope you’ll enjoy. Thank you for your appreciation. Can you send me a download link anyway, please? I never publish my email addresses in forums and so on because I prefer to keep it private to avoid spam, virus & undesired mail… But I’ve been forced to add the address when I wrote these comments. Can’t you see it? If not, there’s a way to send it to you, in private? Hi, I respect your privacy and sorry to say there’s no other way to complete this task. For downloading the collection you have to put your email address. If you face any problem then try with a different browser. Otherwise, I need your email to send the link. By the way, the email you have added to this comment is it a valid one? Can I send the link to this address? Thank you for your enthusiasm. I really appreciate it. Ehm… Yes, the email address I have added to these comments is a valid one and you can send the link to it. Thank you for your cooperation. I’ve sent the link. Good day. How the “Download with a tweet :)” works? I need to post a review? Maybe a F.A.Q can help with it. hi, please share download link. Link sent. You’re most welcome. Please can you send me the download link to my email mehedihassanshubho@gmail.com Thanks you . Can you please the download link to my email .Thanks you very mush. sir,please send me the download link. I have tried many times but it restarts again and again after reaching above 60%. I’ve sent you the download link. Try with it. tried but does’t download still restarting. Can you please send it to my email at farmgirlartstudio@gmail.com? can you sent the link. Can you please send the bundle zip to mydocs.anand@gmail.com. Told you it can’t be sent via email. I tried downloading thrice total of 551MB discontinues once it reaches 115MB. At last i lost my data without getting benefit out of it. Any way can I get the template collection completely? I would be great if you guys send send me the zip package to my email instead of download link. The end with, I saw few of the templates it looks great. Hey, thanks for contacting us. The problem was with your internet connection, nothing in our end. You can try again although I’ve sent you the download link. Sorry to say that this large size of a file cannot be sent through email. All the best. Hope, you’ve got it right. Hi, check your mail, please. Hi, Can I use these templates for commercial use? Do I have to include any credits? Yes, you can them for commercial purpose. Please have a look at our license. Thank you. You’re supposed to get it by now. This is really Great . Can not believe this is so true but thank you so much Themewagon you are great!!! Hey Ronaldo, you’re very welcome and we’re so happy that you loved our collection. Stay with us. hi !! how can i download those great templetes please ? Could you please tell me what did it say after clicking the download button? I’ve sent you the link though. Please check your email. Have a good day. Could you please send that to me also. It’s sent already. Thanks for the love. Hi, can you help me with the link please? Thank you! Yeah, of course. Open your inbox. It’s sent. Thanks for being with us. I love your templates. Can you send me download link? I’ll appreciate that. I’ve sent the link. You’re always welcome. Hi, i want the download link. Can you send me it to my email? Thank you! Hi Agustin, I’ve sent the link to your email. I’d like to know the OS and browser you’re using. Capture a screenshot of what occurs after clicking the sending button. Thanks for the love. Hope you’ve got it by now. Thanks for visiting us. Hey Elvis, sorry to hear that you’ve been facing troubles while downloading. Could you please tell me which OS and browser are you using? Also, I’d appreciate if you send me a screenshot of what happens after pressing the send button. I’ve sent the link to your email anyway. All the best. The link’s already in your inbox. Thanks for the inspiration. Themewagon ıs great for me. Thank you very much. You’re very welcome. Stay in touch. You’re supposed to get the template already. Please check your email. Thanks for stopping by. Please check your email. Hope you got it already. Glad to know that you love it. Would appreciate if you can send it to me at 136@holbertonschool.com. Thanks!! Thanks for your interest. Hope you got it right. Could you please send the download link to coolsonz@gmail.com? Hi, thanks for your enthusiasm. Please check your inbox now. please what are the steps to download the 100 templates. I have tried by all means and I have not been able to. Check your email. Hope you got it already. Check your mail now, please. Could you please send me the download link? Thank you. Sent to your email. Hope you got it. I’ve sent the link to your email. Please check it now. And you’re most welcome for visiting our site. The link was sent to your mailbox. I appreciate your enthusiasm. Hi, can you please send me the download link on yoheshe@yahoo.com? I did not receive the link to download the templates in my mailbox… Could you please send it to me ? Can you please send me download link to my email nitish12345singh@gmail.com. I just sent you the download link. This is really Great . Can not believe this is so true but thank you so much Themewagon you are great. This is amazing, would really like the download link. Been trying to download but doesn’t seem to work? Hey, I’ve sent the download link to officialbusinesscharles@hotmail.com. If you have different email please let me know. Thank you. Hi, thanks for the appreciation. Check your email for the download link. The link was sent to your inbox. Thanks for checking it out. Hi, Great package, can you provide the download link via email. Please, check your inbox. The link is there. Thank you. Check your inbox, please. Thanks. Hi Jerry, FYI, the whole bundle is of HTML5 templates. Meaning you can’t use it on WordPress. You can edit and upload (via FTP) the Garo Estate as an HTML template. Thanks for using it. Hello, can you please send me the download link on g0g0_de@abv.bg. Hi, thanks for your interest. The link was sent to your inbox. That was amazing 100% free theme collections. I cant believe it. Thanks, themewagon..
Can you please the download link to my email ..pls Thanks you .. I just email you the download link. Got the link. I misspelled my email. sorry. I just sent you the link via email. Hi, I got this message. Hi i just donated and got a link that does not download. If you are unable to download please let me know. I just emailed you the download link. We’re glad to know that you like it. I’m a little confused. I dont see a direct download. So I clicked Download with a Tweet, posed the tweet, but I still cant download. Thanks for your good word. It will help us move forward. Its an amazing offer. Thought i am unable to download. I have been clicking the download button and nothing happens. You should get the direct download link in your inbox. If you are unable to download after trying again, please let us know. I can’t believe my eyes. Themewagon what a great surprise and a good way to learn the world how impressive your templates are. Thank you so much. Amazing. It’s kinda hard to believe! Thanks, themewagon! Keep inspiring us and we will do more.